After Bhagawan launched it in a big way on the 85th Birthday celebrations, the project, just like its name, has been gathering momentum and has now become a copious flow (a vahini). Teachers from Sathya Sai schools all over India, the Sai youth and many leading educationists are taking active interest and part in this noble venture. The reader is urged to make a visit to http://www.srisathyasaividyavahini.org/ and gather more insights and inspiration into this noble endeavour. The Workshop aimed at training the teachers from Andhra Pradesh, Karnataka, Kerala and Tamil Nadu in creating respective State Board Syllabus based on the available CBSE Lesson Plans and the SSSVV pedagogy template. The participants had come in sizeable numbers and their strength was above 320. 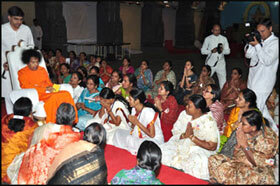 All had gathered in the Poornachandra auditorium and Swami had agreed to bless them all there. 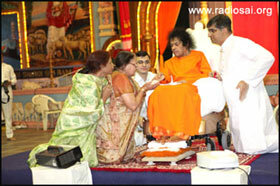 At 6:55 p.m, Swami emerged from Yajur Mandiram. Two members of the privileged staff working for Swami in His various institutions were seated there as it was their birthday. 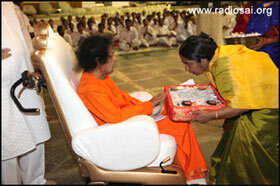 Swami blessed them with padanamaskar and sprinkling akshatha grains and then moved towards the auditorium. He entered the hall and there was a small makeshift stage that had been made. Swami moved to the stage and sat there. Representatives from both the ladies’ and the gents’ side came to Him and offered the work that had been going on and the tasks that had been planned. Swami patiently went through it all and heard whatever they said. He gave vibhuti packets to many of them. 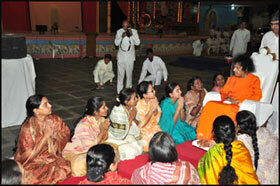 Swami then told that He would quickly move through all the assembled volunteers and bless them all. There was jubilation all around and Swami kept up His word. He moved through each of the lines blessing all the participants. It must have been such a fulfilling feeling for all the participants and indeed the Lord rewards good work! 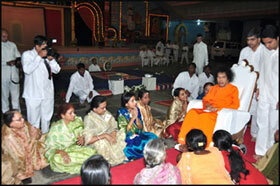 After the padanamaskar session was complete, Swami received aarthi and it was past 7:20 p.m. when He exited the auditorium. Swami got into the car and moved into the Sai Kulwant Hall. He was His beautiful self, tossing vibhuti packets and blessing everyone gathered. 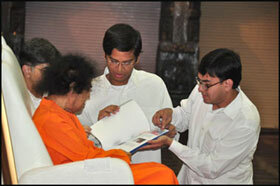 He had not come out for darshan the previous day and Sai Kulwant Hall had been packed that day. With Swami, we cannot make any generalisation. 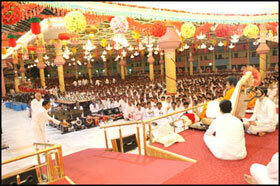 One would think that Swami not coming for darshan may dissuade crowds, but they come with added fervour and enthusiasm. 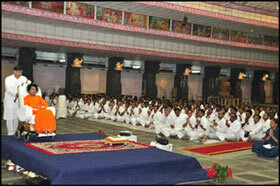 Irrespective of what Swami does, the throngs at Prasanthi Nilayam have simply been growing. On that day a distribution of essential items for those in need had been arranged. As per the programme 653 beneficiaries, 252 ladies, 392 gents along with 9 institutions from various districts of the state were to be blessed with various implements, namely, computers, sewing machines, lady bicycles, wet grinders, pesticides, electrical kits, hearing aid units, telephone coin boxes, tricycles, etc. The centre-block facing Bhagawan was decked with these implements which were to be distributed to the beneficiaries after the programme. 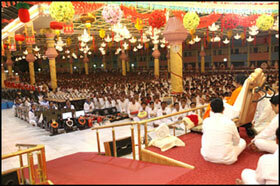 Swami completed the darshan rounds and arrived on stage. 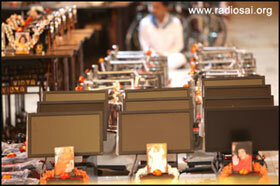 The bhajans were on and Swami asked for the distribution to begin. The names of the beneficiaries were not called out! Swami does not believe in announcements like these. He says, what the right hand gives even the left hand must not come to know! He asked for the gifts to be given silently to all those who were needy! The gratitude in the hearts would reach Him and that is what is important! And so, after a few cards, flowers and brochures were offered, the symbolic distribution was quickly completed and Swami blessed prasadam to be distributed specially to all the beneficiaries who had gathered in the hall. Once this was done, Swami asked for aarthi. It was almost 7:40 p.m. when Swami retired to Yajur Mandiram.